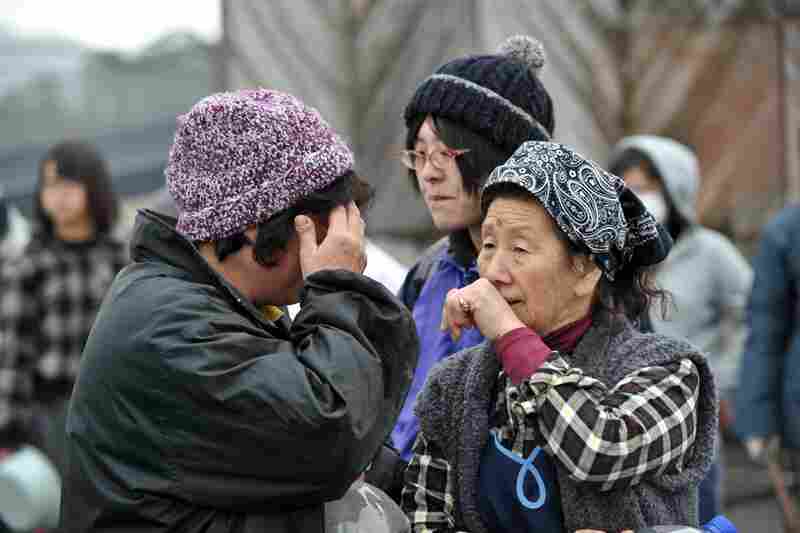 Food, Gas Shortages Amid Relief Efforts The death toll officially climbed above 5,300 Thursday in the aftermath of the earthquake and tsunami that struck Japan almost a week ago. Amid deepening nuclear, humanitarian and economic crises, the U.S. authorized the first evacuations of its citizens out of Japan. 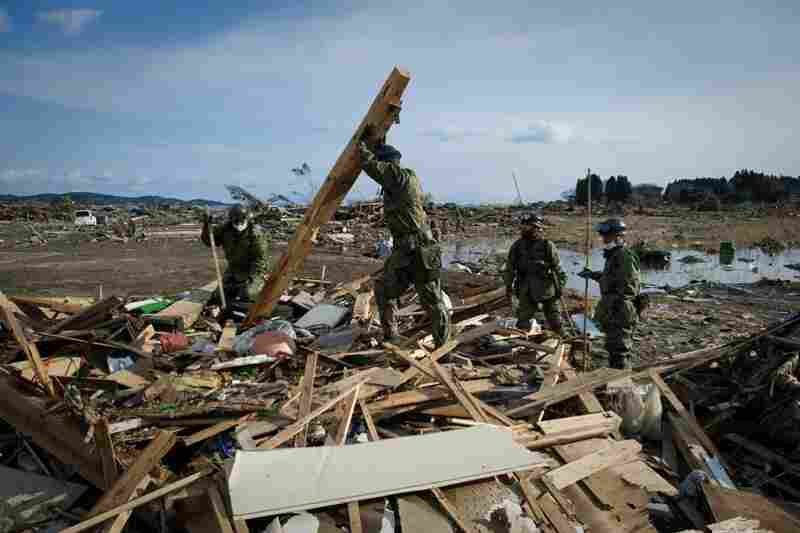 Members of a British search-and-rescue team carry a body removed from a destroyed house in Kamaishi, Japan. The official death toll climbed above 5,300 on Thursday. 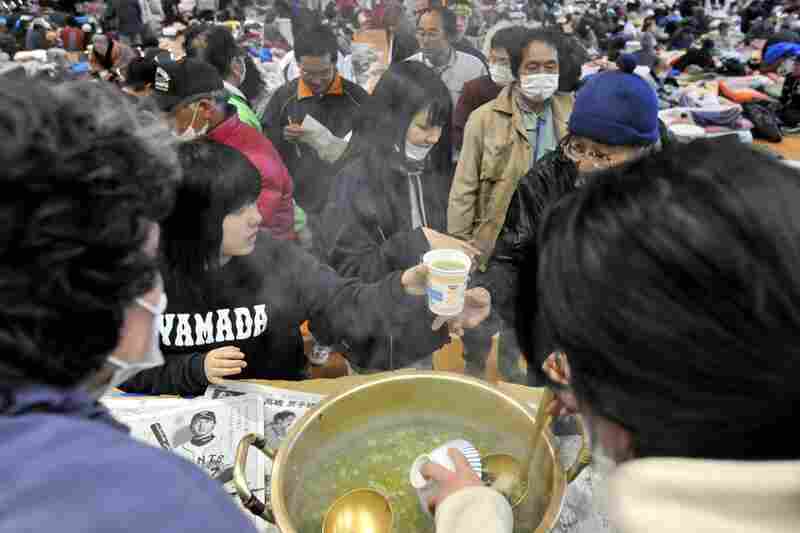 Evacuees receive bowls of soup at a makeshift shelter in Yamada, northern Japan. Basic supplies remain scarce in regions heavily damaged by the earthquake and tsunami. People wait in line for gasoline at a filling station in Ichinoseki, Iwate. 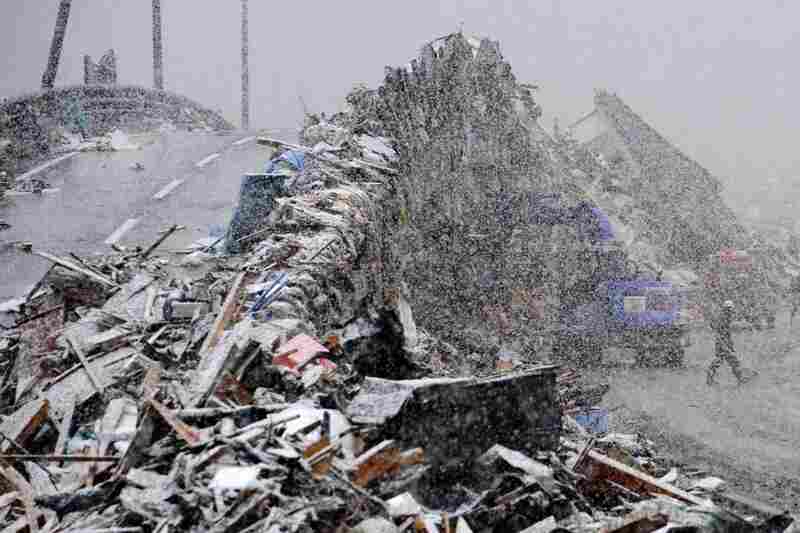 Heavy blizzards swept across Japan's northeast overnight. A woman waits in a line outside a grocery store in Ichinoseki. Food and supplies are scarce in supermarkets like this one in Hiraizumi in Iwate prefecture. 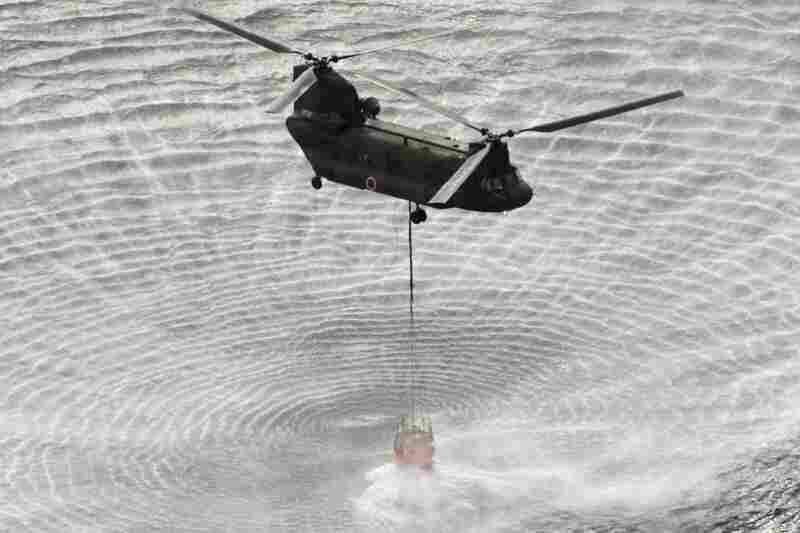 A military helicopter scoops water off Japan's northeast coast on its way to the Fukushima Dai-ichi nuclear power plant on Thursday, in an effort to cool overheated fuel rods inside the core. 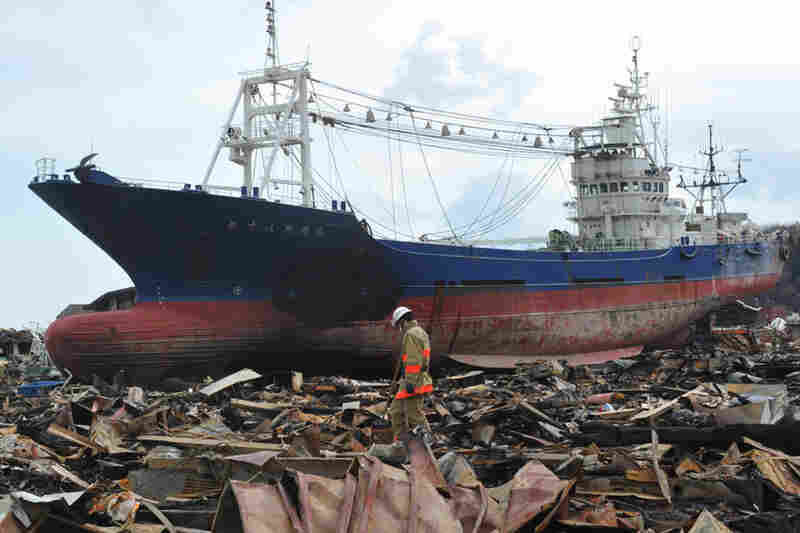 Japanese rescuers search through debris in front of a large ship washed ashore in Kesennuma, Miyagi prefecture. 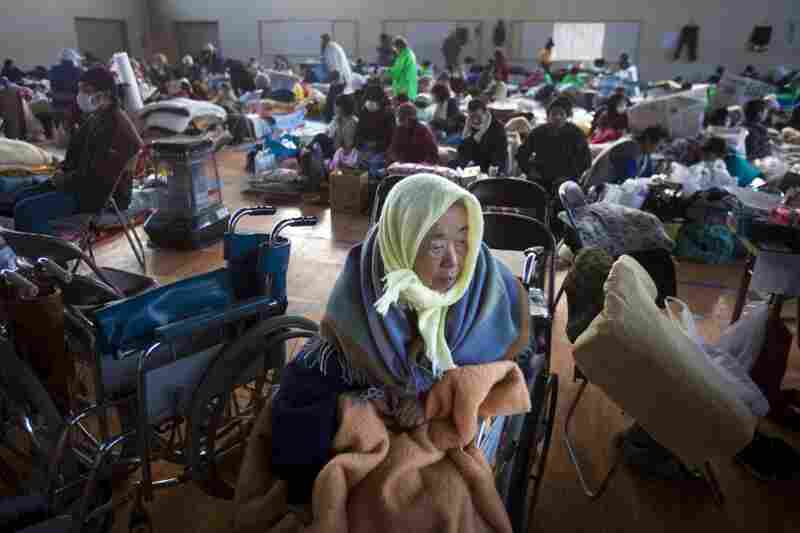 Refugees, including 53 who were saved from a retirement home, take shelter inside a school gym in the leveled city of Kesennuma, northeastern Japan. 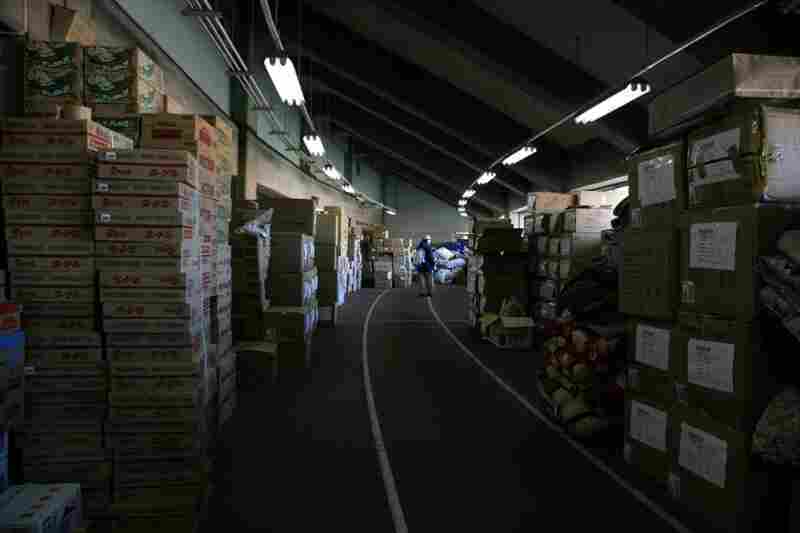 Relief supplies sent from around Japan are piled up in Koriyama, Fukushima prefecture. 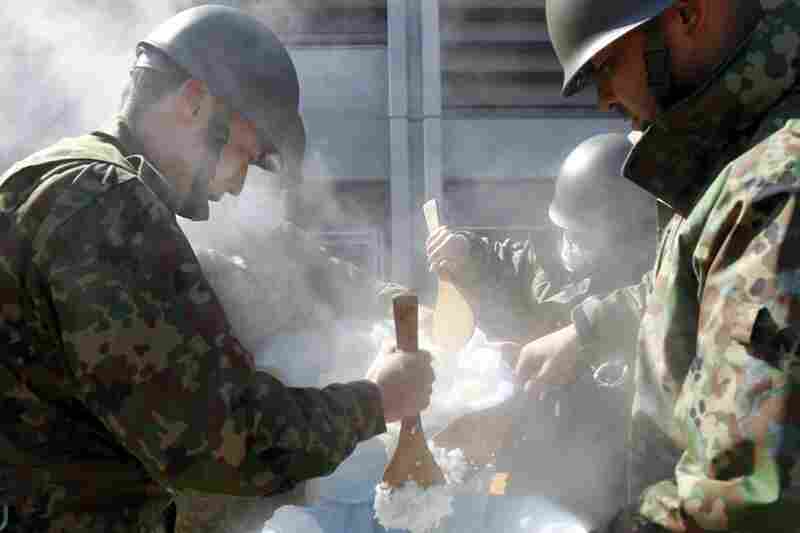 Japanese soldiers cook steamed rice to distribute to evacuees in Koriyama, Fukushima prefecture. An elderly woman is scanned for radiation screening center in Koriyama, Fukushima prefecture. Japanese soldiers comb through the rubble of a destroyed building in the city of Kesennuma, Miyagi prefecture. 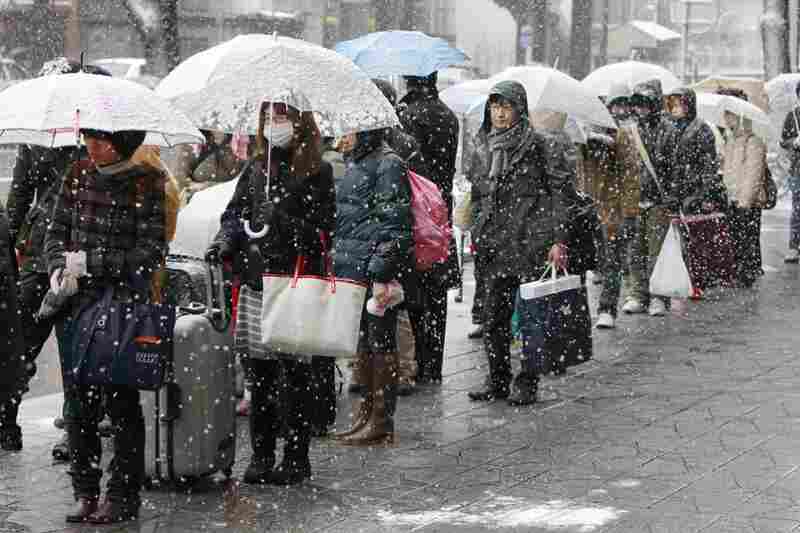 People wait in the snow for a bus to leave town in Sendai, Japan. Fuyo Murakami (center) and her husband Yoshiro (left) say goodby to a relative as they leave for Hokkaido in northern Japan. 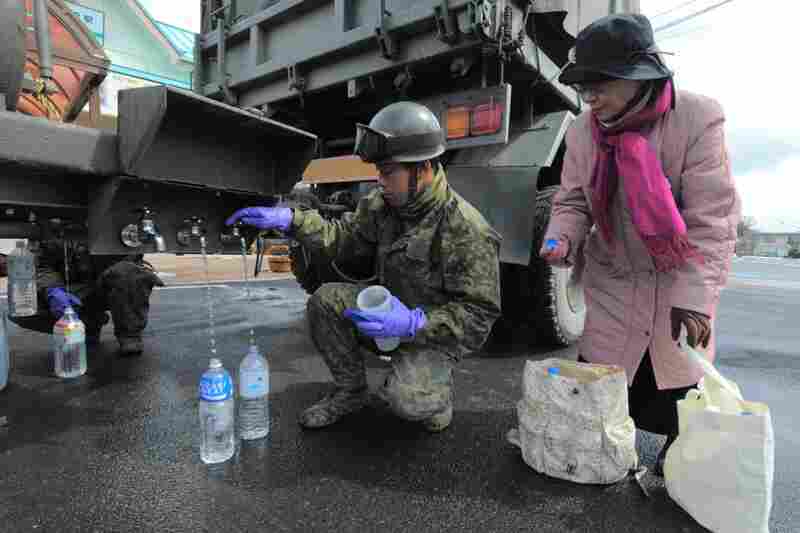 A Japanese soldier provides water for local residents in Kesennuma, Miyagi prefecture. Shortages of food and gasoline were being felt in parts of Japan on Thursday nearly a week after a deadly earthquake and tsunami, as people hoarded basic items fearing that supplies would soon dry up. The official government toll from the magnitude 9.0 quake and resultant tsunami was increased to more than 5,300 people Thursday, but was expected to climb to well over 10,000 as hopes of finding survivors dimmed. Chinese trainees attempt to gather information on how to return to China in Onagawa, Miyagi prefecture on Wednesday. 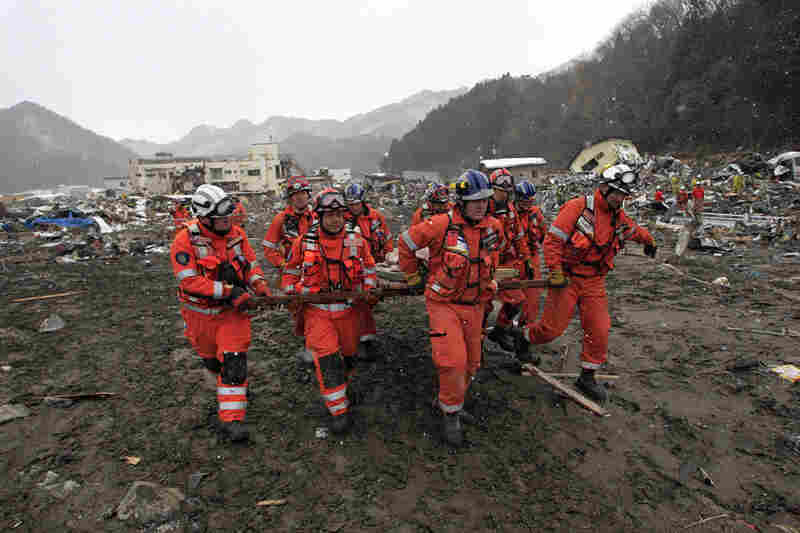 A Japanese firefighter (front) passes members of a search-and-rescue team as they search for survivors in Kamaishi in northeastern Japan. Two women wait for water at a distribution point in Ofunato northeastern Japan. 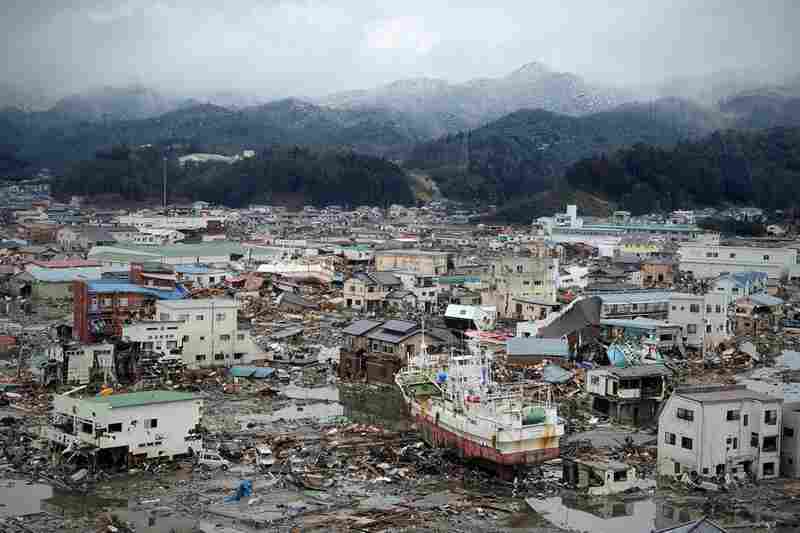 Houses and boats sit side-by-side in the devastated city of Kesennuma. 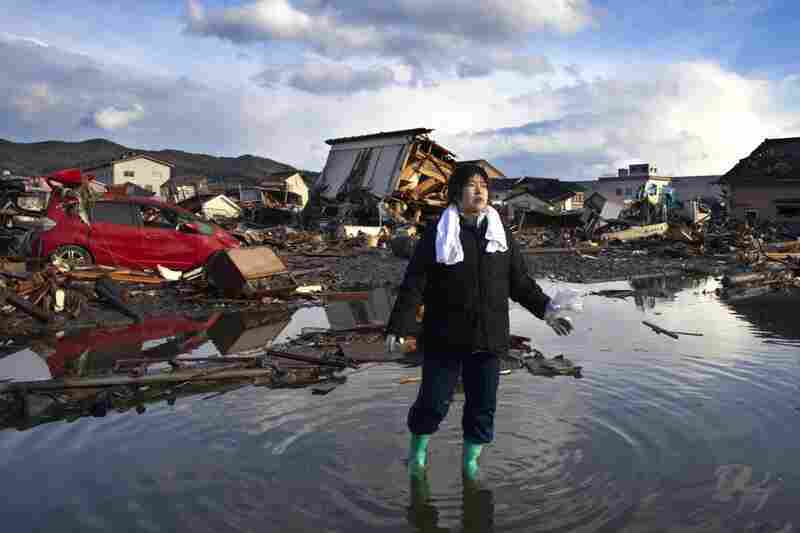 Chieko Chiba walks through the rubble after visiting her destroyed home in Kesennuma, Miyagi province. 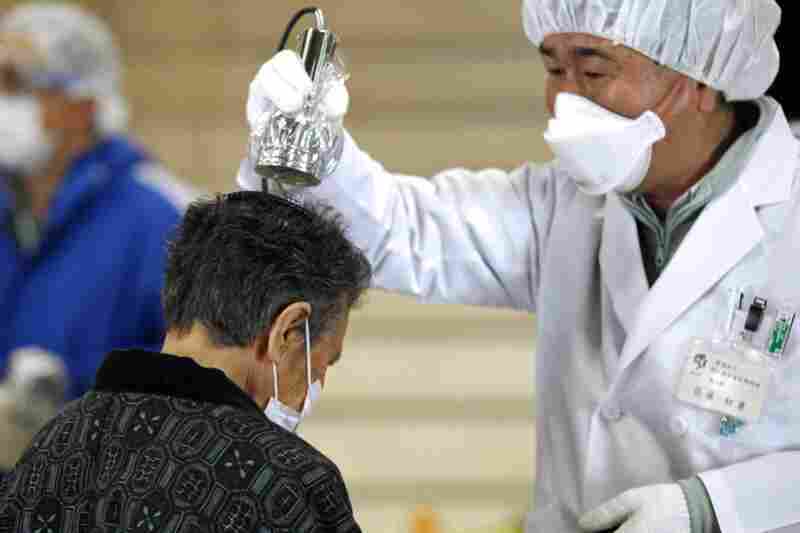 A man is scanned for radiation exposure at a temporary scanning center for residents near the Fukushima Daiichi nuclear power plant in Koriyama, Fukushima prefecture. 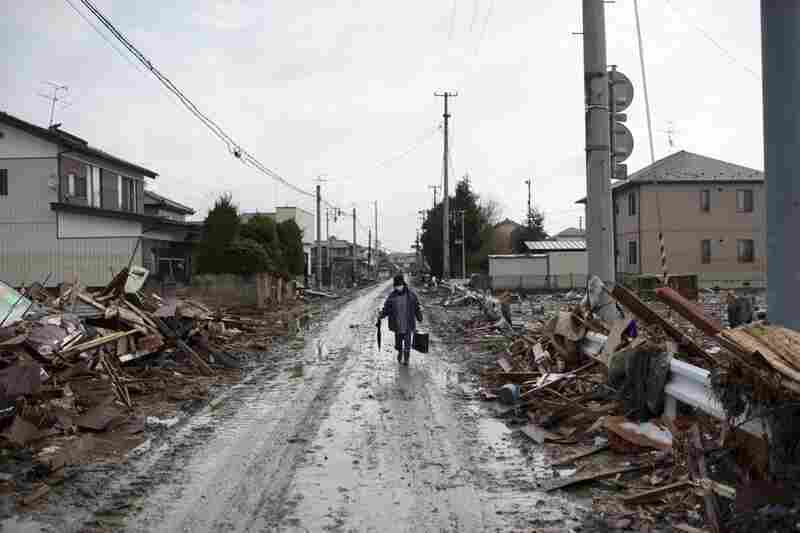 A resident walks along a road lined with debris in Sendai, Miyagi prefecture on Wednesday. Rescue workers carry a body from the rubble of a village in Kesennuma, Miyagi province. 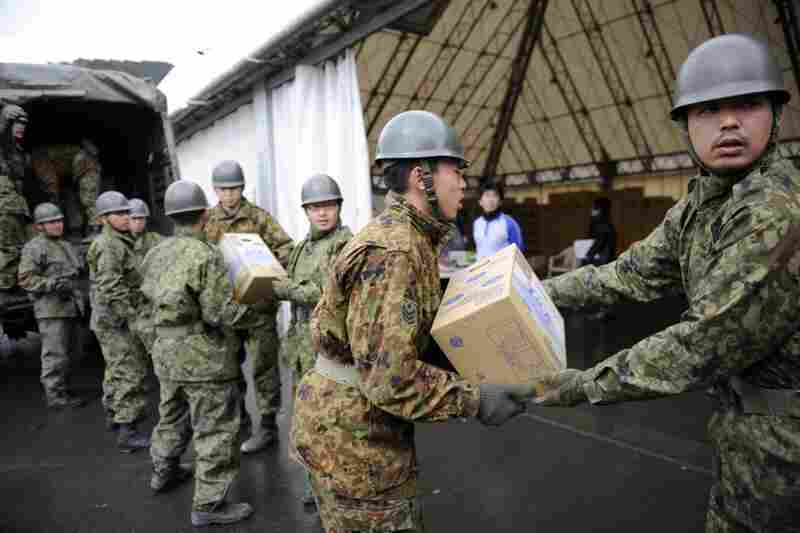 Members of the Japanese military load relief goods at the port in Kamaishi City, Iwate prefecture. 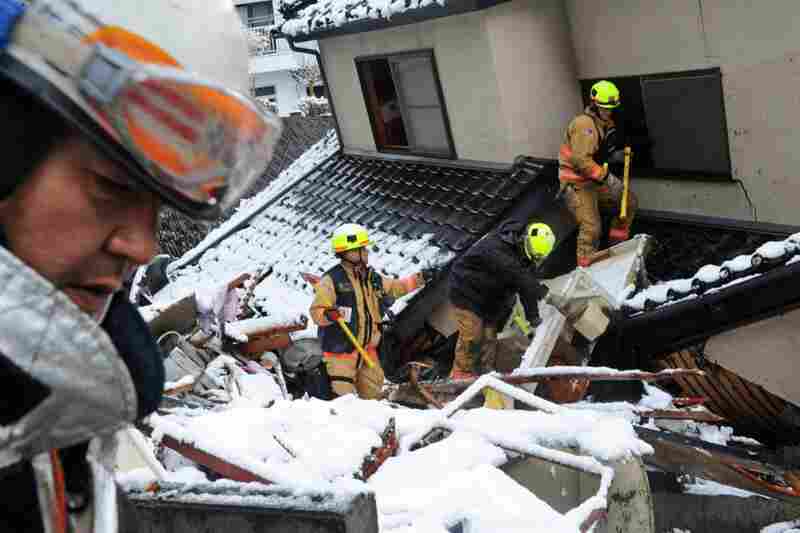 Firefighters operate heavy machinery in the snow while seeking survivors in Otsuchi, northern Japan. 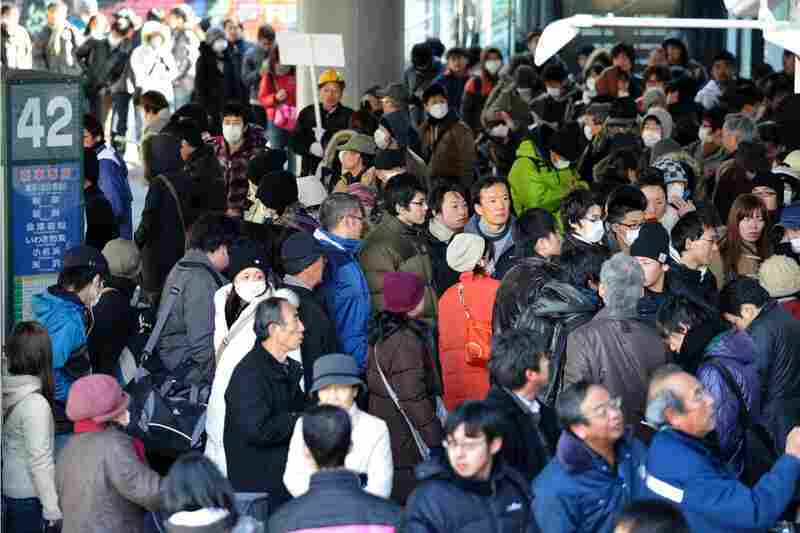 People crowd at a bus terminal in front of Sendai Railway Station in Miyagi prefecture. Railway services have been canceled since the earthquakes around the area. 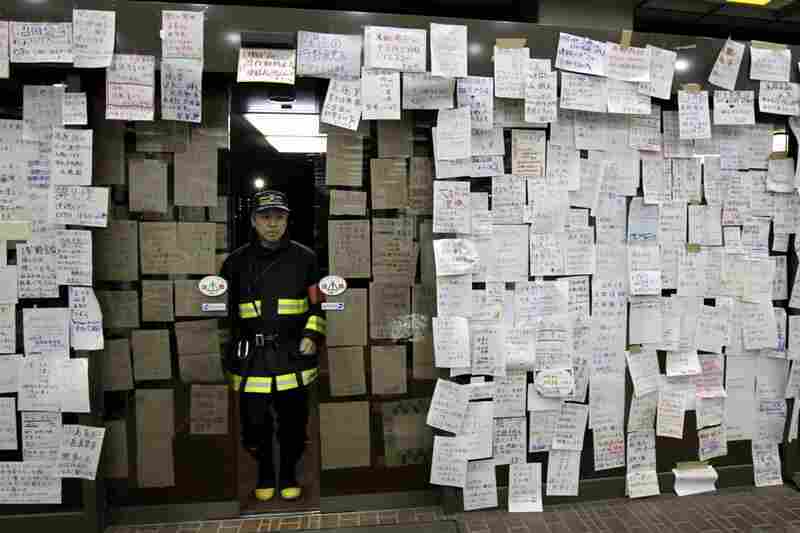 Survivors' notes seeking information about missing relatives and friends hang on the entrance of Natori City Hall in Natori, Miyagi prefecture. 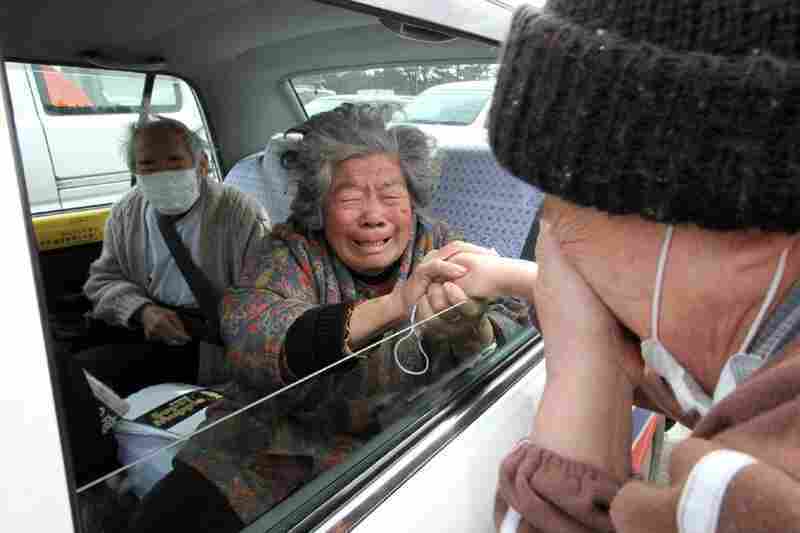 Reiko Miura, 68, cries as she looks for her nephew at in Otsuchi, Iwate prefecture, northern Japan. 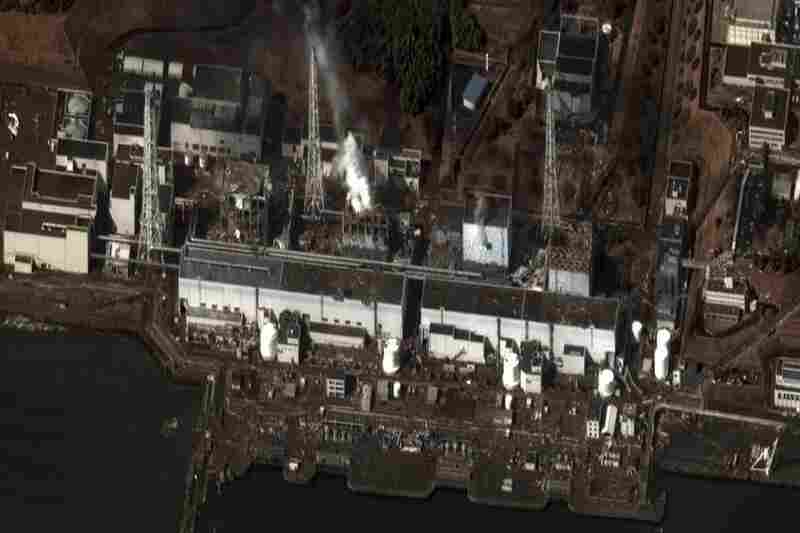 A satellite photo shows the damage after at the Fukushima Daiichi nuclear power plant. 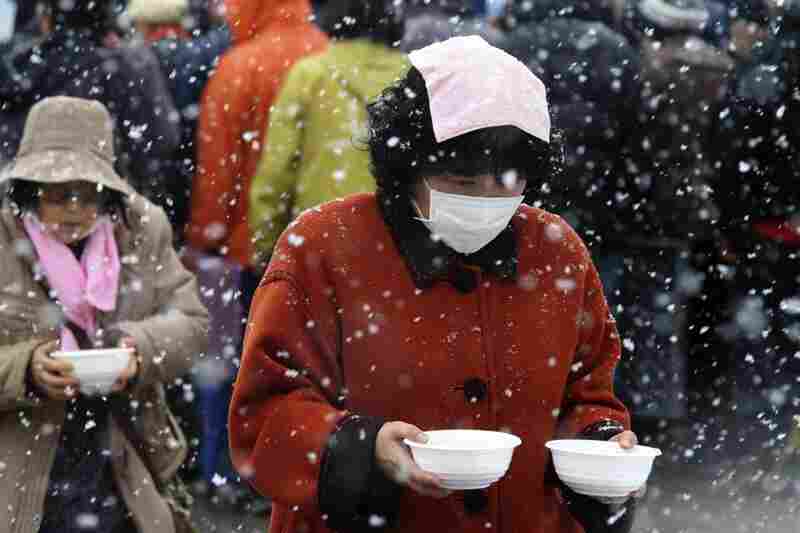 Evacuees carry food from a soup kitchen back to their makeshift shelter in Minamisanriku, northern Japan. 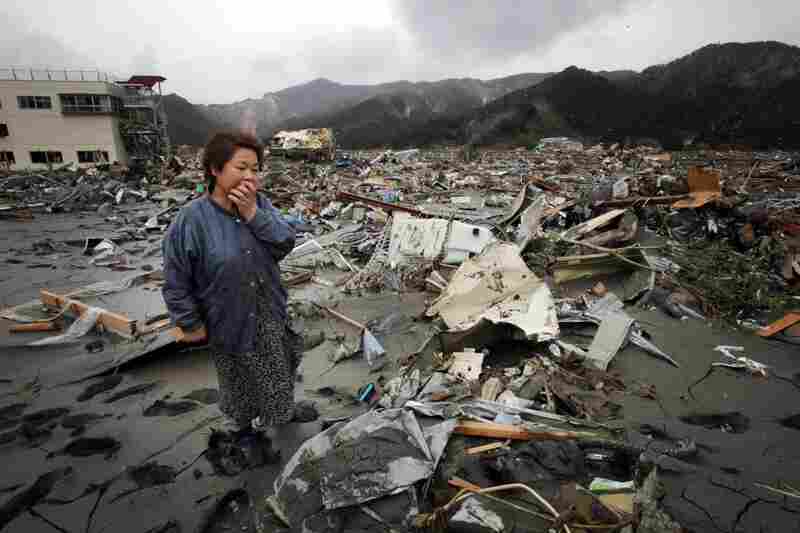 The official death toll from the earthquake and tsunami reached more than 5,300. The Pentagon said some U.S. troops on relief missions could move inside a 50-mile safety zone around the damaged Fukushima-Dai-Ichi nuclear power plant and that they would be issued anti-radiation pills. The Department of Defense was sending unmanned Global Hawk drones and a C-135 specially equipped to detect radiation to the area around the stricken plant. The U.S. authorized the first evacuation orders for Americans who wish to leave Japan, offering assistance for family members and dependents of U.S. personnel in Tokyo, Yokohama and Nagoya. 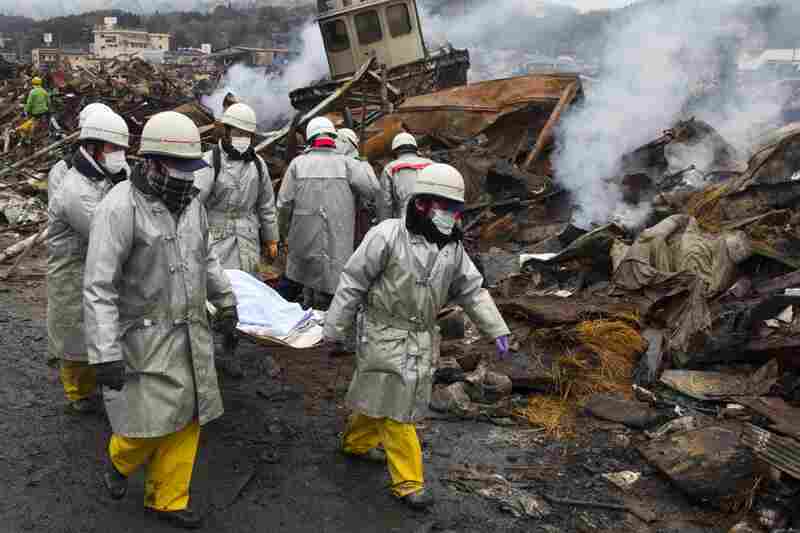 The Japanese Red Cross has dispatched 115 national disaster response teams and nearly 1,000 medical staff. 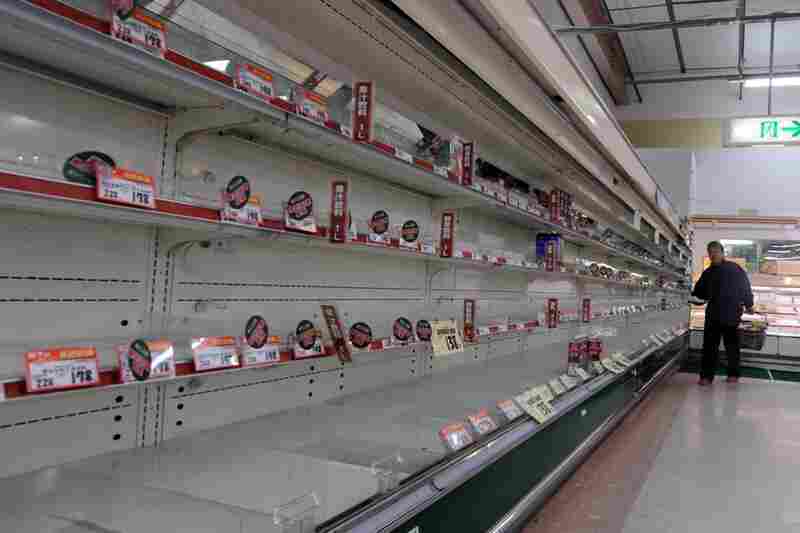 NPR reporters in northern and central Japan said staple foods were hard to come by and in some areas gasoline was scarce. Shoppers in the Tokyo metro area, 150 miles from the crippled Fukushima Dai-Ichi nuclear power plant, had cleaned some supermarket shelves of items such as rice, bread and yogurt. 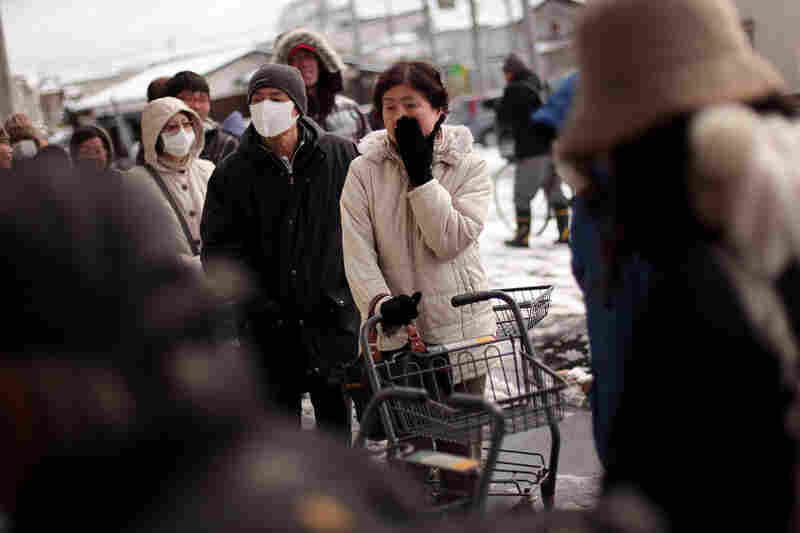 Store managers in Aomori, on the northern tip of Japan's main Honshu island, told NPR that the area had been hit by a combination of hoarding by shoppers and a breakdown of the supply chain. That chain normally is fed by ports, roads and railways, many of which are now heavily damaged in wake of last week's disaster. In Ofunato, not far from the epicenter of the quake, Yuko Niuma looked out over the harbor, where trawlers were heeled over on their sides by the power of the tsunami. "There is enough food, but no fuel or gasoline," Niuma, 46, told The Associated Press. Earlier this week, Japan's agriculture minister warned people against hoarding, saying it would make it even harder to get supplies to those most affected by the quake and tsunami. 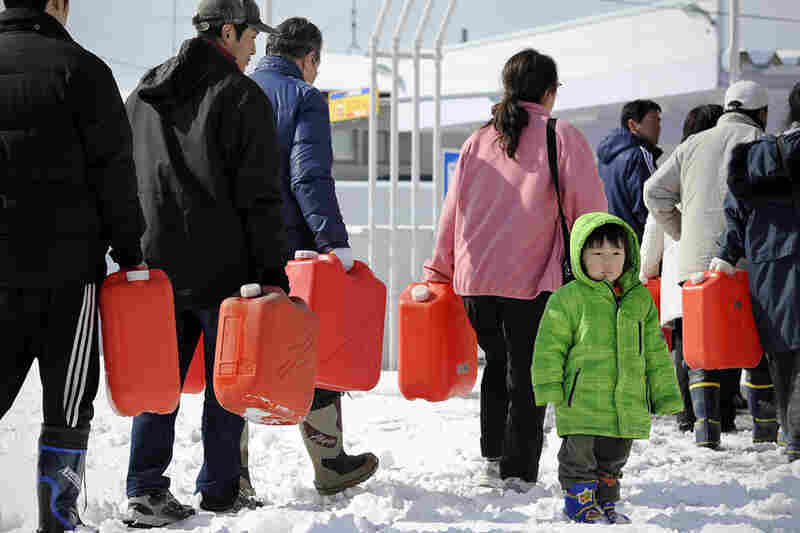 Along the coast, people must stand in line for food, gasoline and kerosene to heat their homes. In the town of Kesennuma, 55 miles north of Sendai, they lined up to get into a supermarket after a delivery of key supplies, such as instant rice packets and diapers. Each person was allowed to buy only 10 items, NHK television reported. The government has told residents in Tokyo to expect rolling blackouts in some neighborhoods to help conserve power. Finance officials from the Group of Seven major industrialized countries agreed Friday on coordinated currency intervention to support the Japanese economy. It's the first time the G-7 countries have jointly intervened in currency markets since the fall of 2000. Meanwhile concerns about radiation from the Fukushima plant prompted the U.S. government to authorize the first evacuations for Americans out of Japan and warn U.S. citizens to defer all nonessential travel to any part of the country. The travel warning extends to U.S. citizens already in the country and urges them to consider leaving. The authorized departure offers voluntary evacuation to family members and dependents of U.S. personnel in Tokyo, Yokohama and Nagoya and affects some 600 people. The decision to begin evacuations mirrors moves by countries such as Australia and Germany, who also advised their citizens to consider leaving Tokyo and other earthquake-affected areas. Tokyo, which is about 170 miles from the stricken nuclear complex, has reported slightly elevated radiation levels, though Japanese officials have said the increase was too small to threaten the 39 million people in and around the capital. Earlier in the crisis, the U.S. had advised its citizens in Japan to follow the recommendations of the Japanese government. Then on Wednesday, the Obama administration urged Americans within a 50-mile radius of the stricken nuclear plant to evacuate, raising questions about U.S. confidence in Tokyo's risk assessments. Japan's government was urging people within 20 miles to stay indoors if they could not evacuate. 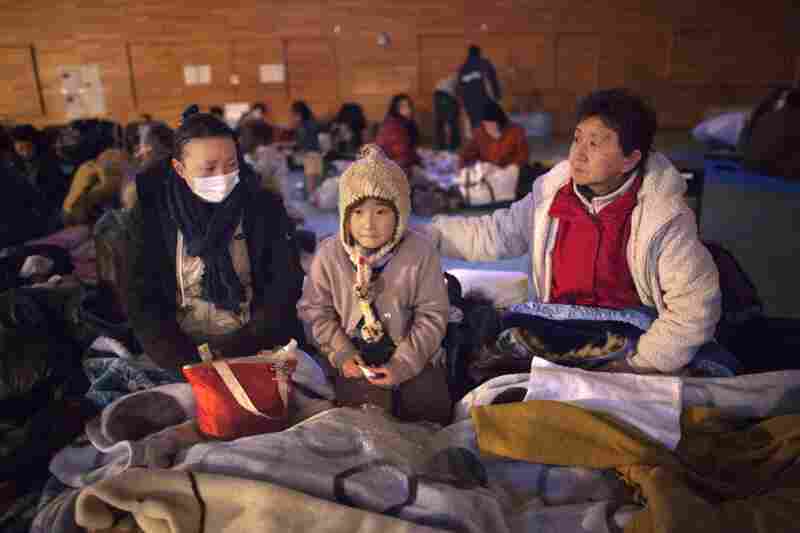 Japanese police said more than 452,000 people were staying in temporary shelters. President Obama said authorities did not expect harmful radiation from the disaster in Japan to reach U.S. shores. At a press conference Thursday, he also said he had ordered a comprehensive review of the safety of nuclear plants in the U.S. The Pentagon said U.S. troops working on relief missions can get closer than 50 miles to the plant with approval. Lapan said the U.S. would review requests from the Japanese for assistance that would require troops to move within that radius, though no approval for such movement had been given since the stricter guidelines were enacted. The Pentagon said troops are receiving anti-radiation pills before missions to areas where radiation exposure is likely. With the arrival of three more ships to the massive humanitarian mission, there were 17,000 sailors and Marines afloat on 14 vessels in waters off Japan. Several thousand Army and Air Force service members already stationed at U.S. bases in Japan have also been mobilized for the relief efforts. The Pentagon said Thursday that it was sending more specialized aircraft to help determine the scope of the nuclear contamination around the Fukushima complex. A converted U.S. Air Force C-135 called Constant Phoenix would take air samples, officials said. The plane, known informally as "the sniffer," has been used in the past to detect North Korean nuclear weapons tests. Unmanned Global Hawk drones and Cold War-era U-2 reconnaissance planes also are being used to help the Japanese assess damage from the disasters. Meanwhile, a planning team from the U.S. Northern Command in Colorado was on the ground in Japan. It could pave the way for deploying a team of soldiers that specializes in dealing with chemical, biological and nuclear incidents. 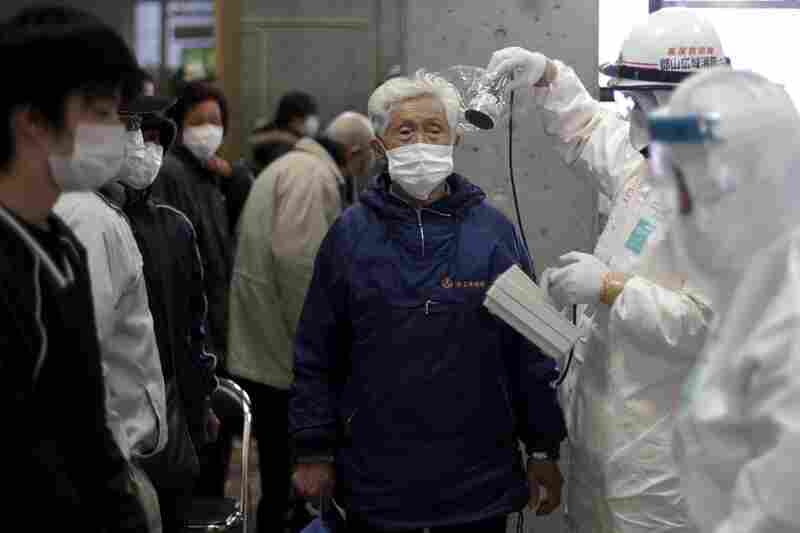 The thousands of residents evacuated from the exclusion zone surrounding the nuclear plant were among those getting help from the Japanese Red Cross, said International Red Cross Federation spokesman Paul Conneally. The organization dispatched 115 national disaster response teams and nearly 1,000 medical staff to the massive international humanitarian mission already under way. Some international teams ended their search and rescue efforts Thursday, acknowledging there was little prospect left of finding missing people still alive. "We have no more tasks," said Pete Stevenson, a firefighter heading Britain's 70-person team. "The Japanese government has told us they are now moving from search and rescue to the recovery phase." The catastrophe has taken a particularly heavy toll on the elderly in this rapidly aging nation. Many have already died and now those who lived are struggling to survive in cold emergency centers or hospitals without electricity or water and shortages of everything from medicine to adult diapers. On Monday, about 100 patients were moved out of a hospital and into a temporary shelter at a high school gymnasium in Iwaki, said Chuei Inamura, a government official in Fukushima. Two died in transit and another 12 while at the gym. Plans to transfer them to other hospitals were delayed by a shortage of vehicles and fuel and the fact that nearby hospitals were already full. By Thursday morning, the remaining patients had all been moved to other hospitals. 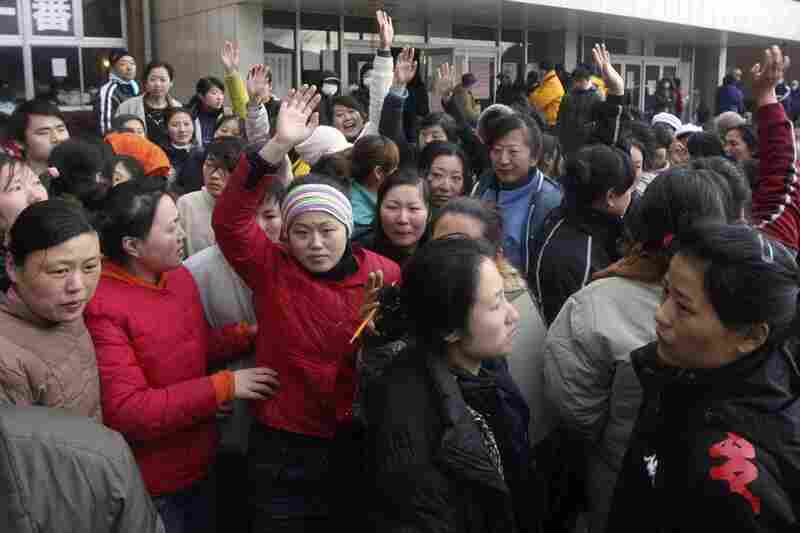 "We feel very helpless and very sorry for them," Inamura told The Associated Press. "The condition at the gymnasium was horrible. No running water, no medicine and very, very little food. We simply did not have means to provide good care." NPR's Jason Beaubien in Aomori, Anthony Kuhn in Kesennuma, John Ydstie in Tokyo and Tom Bowman at the Pentagon contributed to this report, which contains material from The Associated Press.